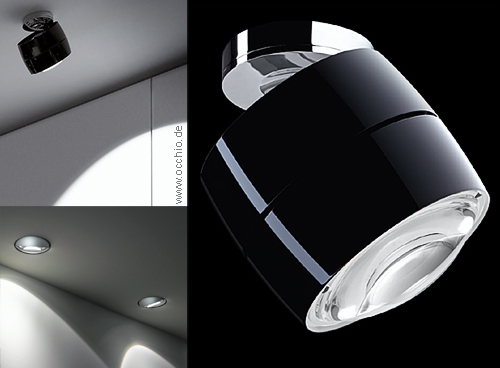 Occhio Più is a modular system for recessed, surface mounted and track spotlights where all components, including lenses, colour filters and reflectors, can be interchanged to offer a wide range of options for residential and commercial lighting applications. The surface-mounted spotlights comes with a sophisticated pivoting and rotation mechanism that enables maximum flexibility. Thanks to an in-house patented system, the13W 700mA LED chip is replaceable like a SIM card, so it can be upgraded any time in the future.